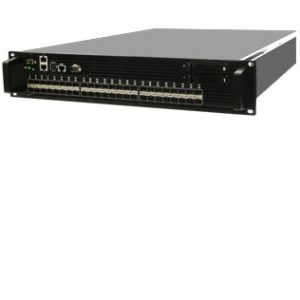 Silicom Hybrid Networking Application Switch combines Intel Network switching in a standard rack mount server chassis. It includes Main Switching Board, built around the Intel® Alta chip set with up to 44 SFP I/Os. The switch is based on Intel® FM6000 family placed on the Main Switching Board, while the Host interface is implemented as PCIe device, based on the Intel® Fortville chip set located on the PCIe. Silicom Networking Application Switch brings highest industry standard server grade reliability, while enabling high versatility with configurable I/O port options. Host interface: up to 5 x 40Gbe thorough PCI Express Gen 3.0 (8Gbps) X8 lanes. – Up to 72x10GbE or 18 x40GbE ports, up to 640 Gbps BW. – KR4, KR, XFI, XLPPI interfaces. – Security – Port-based security (802.1X), MAC address security.